– Founded in the 6th century by the son of Clovis, Childebert. – Became one of the richest in France, a pantheon for Merovingian kings and a center of intellectual life in the French Catholic church until the French Revolution, a large explosion of gun powder destroyed almost all of the complex. – The abbey church remains as the Église de Saint-Germain-des-Prés. – The church is the result of a renovation in the nineteenth century. 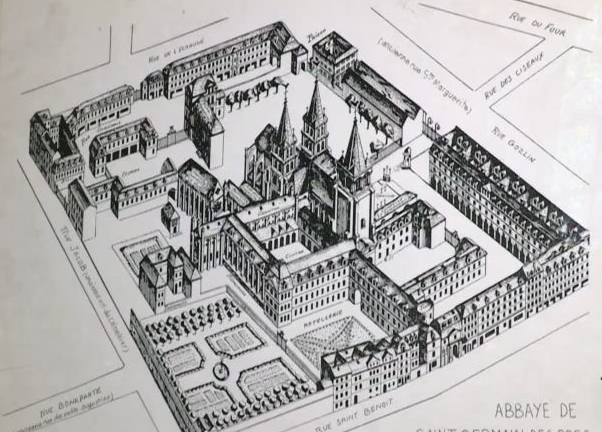 – Gave its name to the quarter of Saint-Germain-des-Prés that developed around the abbey.